Recent Developments in Animal Law provides an authoritative, insider's perspective on key tips for understanding the impact of current regulatory changes on the practice as a whole. 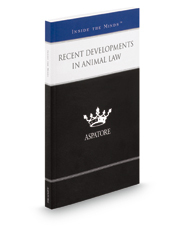 Experienced partners from law firms across the nation guide the reader through both the opportunities presented by the updated legal status of animals and the challenges of defining what an animal is in the eyes of the law. From addressing common violations to outlining considerations for animals in estate planning, these experts stress the importance of helping clients understand the rising costs of animal law and implement new animal treatment standards into their practices. The different niches represented and the breadth of perspectives presented enable readers to get inside some of the great legal minds of today, as these experienced lawyers offer up their thoughts on the keys to success within this evolving field.